So, yeah, it took me forever to read this. 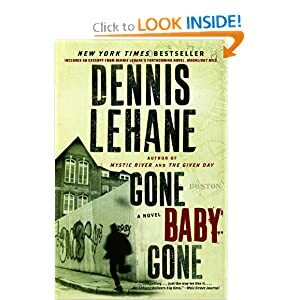 Not because Dennis Lehane isn’t a good writer — he is. Not because the story wasn’t good — it was. It was my fault — all me. Well, me and Sleep and the fact that I was also (well, still am) reading The Amazing Adventures of Kavalier and Clay, which is good, but has a more meandering plot, slower pace and 150% the pages. These two don’t have a similar theme unless you want to start reaching with absentee parents or urban neighborhoods — and I don’t. I got to see Dennis Lehane at Sleuthfest prior to finishing the book. When he started talking differences between the end of the book and the end of the movie, I had to kind of do a mental “lalalalalalalala.” Didn’t really work, though. So, when I finally reached the end, the dual images were in my head. It was okay, though, because not having seen the movie, I just pictured my version of Patrick in two places, side by side in my head. Both make the reader feel as hopeless as Patrick does. And I can see why he didn’t return to those characters for a while. Thing is, while I know, as a part-time awful writer and as an avid reader of lots of varied stuff, I know it had to end the way it did. It’s not satisfying within its genre otherwise. It’s not satisfying to the reader who’s come to live in Patrick’s head otherwise. It’s not satisfying even as social commentary otherwise. But, as someone who works with messed-up kids who might be better off if they got snatched and dropped off in the burbs or the woods or anywhere where love was more prevalent than crack and guns…you want Angie to win that argument. You can talk away the killing of the drug dealers because you let your self-righteousness take over because you’ve listened to the “fast money is good money” spiel too many times. You can try to forget the shooting of the guys in the bar because, well, the one would have been better off if no one had known any better and the other you just “met” in that fictional little world so you’re just not invested yet. And besides, he signed up for the risk, right? Or so you tell yourself. Except Patrick isn’t written to be able to overlook that stuff and in the end, the book wouldn’t be very good if he was.